I created this pie for a contest that featured xylitol, so I had to convert the sweetener to erythritol and stevia. I am generally pretty good at doing this at a glance, but I cannot be sure that you can make this pie without slightly tweaking the stevia and erythritol amounts. Fortunately, you will easily be able to adjust the sweetness to your liking by tasting as you go along. Every other aspect of this recipe works beautifully. Low carb sweeteners like stevia and erythritol don’t tend to affect the texture of desserts (unless you are working with chocolate or another substance without much water – see recipe notes) since they don’t provide bulk, unlike sugar. You can easily ascertain the sweetness level of no bake desserts, but baked desserts tend to come out a little less sweet after heating, so keep this in mind if you taste a raw dough or crust. Soften cream cheese and peanut butter in microwave on HIGH for 20 seconds. Add cream cheese and peanut butter to a mixing bowl. Measure out granular erythritol. Powder it in a coffee grinder or blender. Add powdered erythritol, stevia, and vanilla to the peanut butter and cream cheese mixture. Beat together on low, then turn up the speed on your mixer and mix the until thoroughly combined. Smooth mixture around bowl with a spatula if it looks crumbly until it becomes a smooth paste. In a separate bowl, combine heavy cream with the 2 tablespoons of powdered erythritol and a tiny pinch of stevia. Beat on low until you see soft peaks, then raise the speed on your mixer, and beat until you see stiff peaks. Do not overbeat the cream. Using a spatula, take a generous dollop of whipped cream and stir it into peanut butter mixture to lighten it up and smooth it out. Gently fold in the rest of the whipped cream until most of the streaks are gone. Smooth mixture into the Sugar-Free Chocolate Cookie Crust (see recipe below) and chill in the refrigerator for several hours, preferably overnight. Top with Sugar-Free Chocolate Peanut Butter Topping (recipe below) and Sugar-Free Whipped Cream Topping. Powder erythritol in a coffee grinder or blender. Melt chocolate and butter together in a microwave safe mixing bowl for 35 seconds. Stir well. Heat for another 10 seconds, and stir chocolate and butter until smooth. Whisk egg, stevia, vanilla, erythritol into chocolate mixture. In another bowl, combine almond flour, salt, baking powder, and cocoa powder. Add the dry ingredients to the chocolate mixture, and stir until a ball of dough forms. Refrigerate the dough for a few minutes before pressing it into a pan if it is sticky and too difficult to handle. Grease a pie tin, and line the bottom with a circle of greased parchment paper. I create my parchment liner for pie plates by tracing the bottom of a pie pan on top of a piece of parchment paper and cutting out the circle of parchment. Press dough into bottom and up sides of tin. Poke holes all over crust with the tines of a fork. Bake for 17 minutes. Freeze crust for 20 minutes, or until no longer warm to the touch. The topping is optional, and can be omitted or cut in half if you are saving carbohydrates. It’s quite rich! It adds a decorative touch criss-crossed over the top with a piping bag. You can just use a plastic bag with the corner cut if you don’t have a piping bag. Melt chocolate, peanut butter, and butter for 30 seconds. Stir well. Melt mixture in 10 second intervals, until it can be stirred smooth. Stir in xylitol with a spatula, smoothing out the mixture until uniform. Spoon into a zip top bag with straight corners. Make a tiny snip in the corner, and pipe chocolate mixture in a zig zag over the top, rotating and repeating three times. You can try using erythritol in this recipe, but it will taste a bit grainy and will not create a smooth texture when it is mixed in with the chocolate. Beat heavy cream with erythritol and stevia until it stiffens. Be careful not to overbeat it, or it will look grainy and curdled. Spoon or pipe cream on to pie around the border. Refrigerate for several hours, preferably overnight. Drizzle the optional Chocolate Peanut Butter topping on the pie before serving, and wait 5-10 minutes for it to set before serving the pie. The first list of ingredients lists heavy cream, erythriol and stevia twice, each, in different amounts — could you please elaborate? Hi Maria! I hope you do get a chance to make it. Hope your husband enjoys this! Thanks for your quick response. You're right, I missed the whipped cream steps — makes perfect sense now! Hi Lauren! This recipe looks amazing! I have made quite a few of your recipes and everything is always so good. Question… everywhere where it says xylitol, can I just sub erythritol one to one? Like in the peanut butter topping? Sorry, I just found the answer to my question… thanks! Your photos are beautiful. Hope all goes well and you graduate with flying colors! Lauren! I'm so loving you right now. I was at the store today, debating on whether or not I should pick up a jar of organic peanut butter. It's too addicting for me, so I decided against it. Hi, Lauren! First, I love your blog; your recipes are great. However, I was wondering if you know that NuNaturals uses maltodextrin in their stevia, which is a corn product. I am completely grain-free, so I don't use their stevia. Wouldn't the corn product also make the stevia NOT gluten-free? I'm not sure about that since I'm not well-versed on gluten. Just wanted to mention it just in case you weren't aware. I noticed you didn't use xylitol. Can you tell me the problem with it? Thanks! My first time to visit your blog. Very Yummy! Wow! I think I will sub back xylitol for two reasons: First, I can't stand stevia in even the smallest perceptible dosage, and, second, when you chill an erythritol-containing dessert, the erythritol crystallizes back out (or such has been my experience). Another commenter asked why to use erythritol instead of xylitol… Well, simply, the glycemic impact and calories of E are insignificant, and those of X are significant (though still quite low). I don't have problems sweetness-wise subbing erythritol one-for-one in recipes calling for sugar or xylitol, but then again I like my sweets to be mildly, rather than strongly, sweetened. Sweetness is not my major issue. What *is* my major issue? Currently empanadas… just took a trip to Colombia and got stuck with nothing else available for dinner one day, and DAMN but now I can't think of anything else…. @MissDiagnosis: Make sure you check the source of your erythritol and xylitol, too; although erythritol is fermented from sugar and xylitol originally came from birch tress, there are grain-based pathways for each as well. Chemically they should be identical and neither should actually contain grain substances, but if you are super sensitive you may want to be aware. I'm also looking into tagatose and trehalose as alternative sweeteners, but I'm not as sure as I'd like to be of the glycemic effect of trehalose, and tagatose is… well, just plain too pricey right now. Oooh, this looks so decadent! YUM! I love your recipes! This is really great blog post found here….. your blog having very unique content…. Thanks very much! The pie looks and sounds wonderful. Major congratulations on your graduation, Lauren. That's awesome! Wow Lauren! This looks so amazing! I have tried your other peanut butter chocolate pie and was so rich and decadent (and incredibly delicious). My 16 year old son couldn't wait to get home each day to have a piece.! I plan to make this for the next holiday or celebration we decide to have here. I can't wait! Good luck with your studies! I know it's hard work to keep up with everything! I am hopeful that you'll continue to post here when you can because your recipes are wonderful. This looks so good and professionally made. I have never had Peanut Butter Pie. Looks like it's time to give it a try. Hey Lauren, I was just wondering why you always use stevia with erythritol? Why not just one or the other? Thanks so much!! Since Lauren's busy and I know about sweeteners, I'll answer; it's because erythritol provides the bulk of sugar but only 70 percent of the sweetness. For someone like me, 70 percent is enough. But if you want the full sweetness of sugar, you need to make it up with something that has sweetness but not bulk. Stevia is very sweet in proportion to its volume. Using these two natural sweeteners together gives the bulk and sweetness of sugar without the calories or glycemic effects. I hate stevia (a minority of us find it overwhelmingly bitter in any formulation), so I do without it, or use the full volume in xylitol, which is about 90 percent as sweet as sugar and has some calories. Do you ever use PB2, a powdered peanut butter? Thicken it with unsweetened almond milk. The total calorie reduction compared to regular pb is astronomical while remaining high in flavour. Try it out! Jennifer – Thank you so much! I greatly respect your work, so that is high praise coming from you. Brandon – I feel the same way about peanut butter. Like you said, this is a great way to get that PB taste while keeping a safe distance from the PB jar. 😀 Hope your friends enjoy the pie too! I am not studying Nutrition since it's not offered at my school (jealous! ), but am taking other science courses that will hopefully prepare me for grad school. Miss Diagnosis – NuNaturals pure stevia is not bulked with anything, and is maltodextrin free. Please check the product link and read the ingredients at iherb.com. Hope that helps! Sam – It can give some people gastric upset. It definitely has this effect on me, so I try to minimize my use of it. Meg – I am glad you and your son enjoyed the other pie. Hope you will like this one, too! I will try to keep posting, even though it might be a bit sporadic. Erica – The stevia's intense sweetness increases the sweetness of the erythritol and gives it a more sugar-like flavor. I can only recommend NuNaturals though, because it is not bitter tasting to my tastebuds. Hope that helps! Speedwell – Thank you so much for sharing your knowledge! I appreciate you helping to answer questions. 😀 Have you tried NuNaturals? Ahh, I haven't empanadas. You are making them sounds dangerous, LOL. I will get the recipe with the xylitol message to you if you email me. Lauren, I am such a fan of yours! Each recipe I have tried of yours is a winner, I look forward to trying this pie!! Thank you so much, keep up the good work!! Hey–I just wanted to say SPLENDA is awful for you–I mean that it is like a drug. It is WORSE than sugar for your overall health. It weakens blood vessels and the cumulative effect is detrimental; Google "John Ritter" and diet soda/aspartame (witch is basically the same thing as splenda) so I don't recommend it at all! honey, xylitol, maple syrup, etc. but splenda is really horrible.Thanks for your yummy recipes! I will try this recipe. I am salivating by looking the pictures. Hi Alaskan song, I don't use Splenda in any of my recipes. I agree with you re:the questionable safety of it. It also can lend an aftertaste to baked goods. I agree about a book by Lauren! I would buy one for myself and several copies for friends. It's hard to go low carb when you're a hopeless sweet tooth, and these recipes are the only thing that have made that part of it tolerable for me! I can't even bear to think of life w/o healthy indulgences now. My PB cup pie is cooling in the fridge right now, yummy! In the directions, it says "Beat in the erythritol on low…Smooth mixture…In separate bowl combine heavy cream with the rest of the erythritol." Later in the directions it says to combine the 2 tbs. of erythritol with the heavy cream for the edge. The recipe calls for 7 tbs. and then 2 tbs. erythritol. How much of the 7 goes in the peanut butter mixture, and then how much makes up the "rest of the erythritol" for the heavy cream that makes the filling? Wow, I am in awe of your site. I just spent half the day yesterday making chocolate cupcakes (inspired by one of your recipes) and was completely exhausted! I made this for my birthday party at work and even though I am the only low-carber at work, all of it was gone by the end of the day and the best comment was, of course, no one could even tell it was sugar free. Thanks so much for all your amazing recipes! This recipe looks amazing! I have made quite a few of your recipes and everything is always so good. Hi Lauren, I hope you still read comments from older recipes and will reply and edit your recipe. I love your blog and bought your e-book. I have made the above peanut butter pie 3 times now and it is delicious! However, I find your recipe a bit frustrating and hope you will correct it. In both the pie filling and crust you list ingredients but do not include when to add them in your directions, which can easily cause someone to leave them out (which I have done!). Could you please clarify/correct the following: first, for the pie filling, your directions say to “‘Beat in erythritol” into the peanut butter mixture, then later you say “In a separate bowl, combine heavy cream with the rest of the erythritol”…you did not split out the erythritol, so how much erythritol are you saying to use in the filling and how much for the whipped cream? (and I’m not talking about the whipped cream you pipe on the outside, this part is clear). Second, you list stevia as an ingredient for the filling but do not include when to add it in your instructions. Lastly, for the pie crust, you list stevia and vanilla as ingredients, but do not include them in the directions for putting the pie crust together. Hey, Kelly! I will rewrite the instructions for this recipe. Thanks for the feedback. I understand how frustrating it can be to be unclear about a recipes instructions. I’m so glad you’ve enjoyed the pie and the book! Hey Lauren! Thanks for the corrections…for the filling though…if your directions are correct….you need to add 2 additional tablespoons of powdered erythritol to the ingredient list …yes, you do have 2 TBS listed, but that is for the 1/2 c. of whipped cream you pipe around the edges, your instructions also say to add 2 TBS of powdered erythritol to the one and a half cups of heavy cream you whip to fold into peanut butter mixture. I’d like to try this recipe with swerve. It measures cup for cup like sugar so I imagine it will take so trial and error. Hi, Mishy. I’ve heard good things about Swerve. How does it differ from regular erythritol? Does it not have that cooling effect? Lauren, I am wanting to make this recipe for the holidays because my husband loves anything peanut butter and chocolate and we are trying to eat healthier. I have a question about the peanut butter you used. In the first list of ingredients you have creamy peanut butter and then later you list peanut butter again but it says natural peanut butter. I know that natural peanut butter tends to be not as dry as regular peanut butter. So, I just wanted to check to see if you are actually using natural peanut butter throughout the recipe? Thanks!! Hi, Gina! If I remember correctly, I used No-Stir peanut butter. It may have been a brand like Maranatha that’s all all natural, or it may have been Jif. I don’t worry too much about purchasing a particular brand of PB because there’s such a small amount of added sugar or oil that it doesn’t concern me. The filling might not be perfectly smooth if you use a natural PB. Some of the natural PB I’ve tried has been a bit gritty. Kroger carries a really smooth natural PB with a yellow label, if you are looking for a good one. The recipe contains enough moisture from the cream and cream cheese that the type of PB should not make a difference. Your recipes are so good!! We tried the key lime pie last weekend and it came out fabulous! As spot on in flavor as I think a low carb version could be! 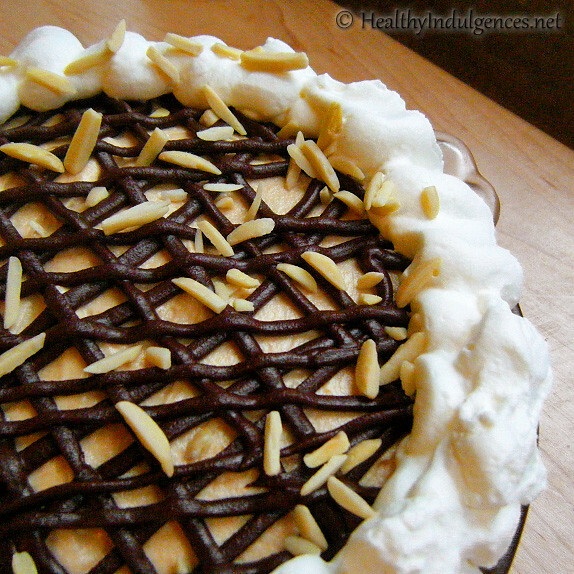 So this weekend I wanted to try the peanut butter pie for a party. I did make several modifications to help lower calories and increase the protein as I’m not lucky enough to just count carbs! I swapped out the pb for 1 cup of pbfit, which i creamed with the cream cheese and 1/2 fairlife milk, then instead of heavy cream I used 1 cups of non fat plain greek yogurt. Copying the key lime recipe, and realizing the pie would need more structure, I added 1 packet unflavored gelatin dissolved in hot water. Then poured it into the crust and it firmed up perfectly overnight. Dense, creamy and protein packed! Thanks so much for the peanut butter pie recipe! !